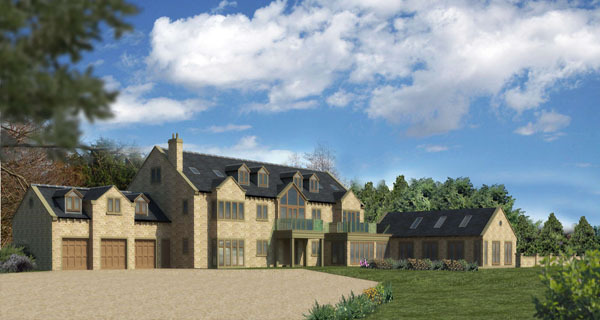 We are providing a full architectural service for this project and are currently undertaking a Planning Application for this luxurious new-build family house in a secluded setting on the outskirts of Bradford. The site is ideal for a large family home as it is currently a flat field surrounded by established trees, which provide a good deal of screening and privacy. Our brief from the client, was to design something that was architecturally traditional, with some contemporary features. The use of reclaimed stone for the walls and stone roof tiles, mixed with frameless glass balustrading and solid oak framed full-height windows helps to achieve that. Internally the layout features a grand open hallway with a sweeping stair up to 1st floor level on both sides of the hall, a swimming pool, cinema, sun-room, large open-plan living / kitchen area, a family lounge, home office, gym and seven bedrooms (most of which have en-suite facilities). We are hoping to obtain Planning permission from Bradford council during the early months of 2012, with a start-on-site date scheduled shortly afterwards. We are particularly excited about this project and aim to add more information to the website during the coming months.